A Scottish-Italian team of scientists have built a new wave energy device that could help generate low-cost electricity for thousands of homes near the sea. According to the scientists from the universities of Edinburgh, Trento, Bologna and Scuola Superiore Sant’Anna Pisa, the device costs less than conventional designs, has fewer moving parts, and is made of durable materials. 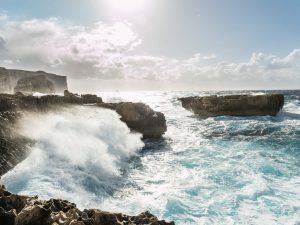 The whole idea behind their invention was to create a device that could be incorporated into existing ocean energy systems and convert wave power into electricity. Small scale experiments in an ocean simulator have so far shown that one full-size device can generate the equivalent of 500 kW, which is enough to power around 100 homes. Moreover, the new design could be used in fleets of low-cost, easily maintained structures at sea within decades, to take advantage of powerful waves in Scottish waters. Called a Dielectric Elastomer Generator (DEG), the device is made up of flexible rubber membranes and is designed to fit on top of a vertical tube. When such a tube is placed in the sea, it partially fills with water that rises and falls with wave motion. As waves pass the tube, the water inside pushes trapped air above to inflate and deflate the generator on top of the device. As the membrane inflates, a voltage is generated. This increases as the membrane deflates, and electricity is produced. The scientists contend that in a commercial device, this electricity could be transported to shore via underwater cables.